The NAACP Stockton Branch hosts its Annual Freedom Fund on Saturday, November 18, 2017 at the Brookside Country Club, 3603 St. Andrews Drive, Stockton, CA. The social gathering will commence at 6:00pm with the Banquet beginning promptly at 7:00pm. The community is encouraged to join the celebration and support this worthy cause as the Freedom Fund Banquet is the key fund-raising activity for the branch and provides the funds necessary to support the branches programs and activities. Each year the NAACP Stockton Branch, through generous donations to the Freedom Fund Banquet College Scholarship Auction, is able to provide scholarships to outstanding students. These scholarships help reduce the costs to students and make it easier for them to achieve their goals for higher education. 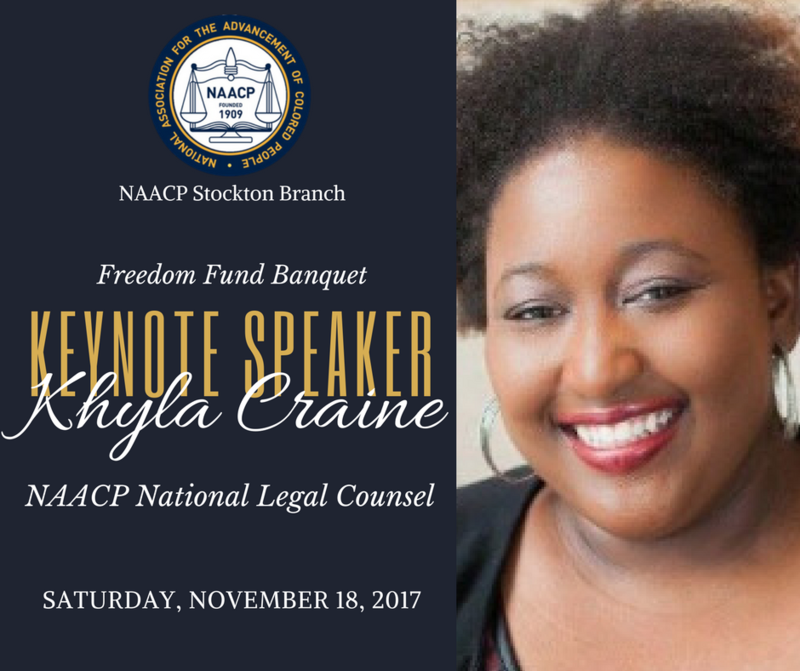 The NAACP Stockton Branch is proud to announce Khyla D. Craine as our Keynote Speaker at our Annual Freedom Fund Banquet! Khyla D. Craine, attorney and activist is an Assistant General Counsel at the National Association for the Advancement of Colored People (NAACP) Headquarters. In this role, Ms. Craine helps to manage the day-to-day legal issues of the NAACP organization in addition to the NAACP’s various civil rights litigation and amicus briefs on education, voting rights, environmental, and criminal justice issues. The Ann Arbor, Michigan native is a graduate of Howard University School of Law and South Carolina State University. As an undergraduate student at South Carolina State, she was known for being politically and socially active and for encouraging her fellow students to be engaged citizens. Ms. Craine’s activism extends through membership in Delta Sigma Theta Sorority, Inc., the American Bar Association and the National Bar Association, where she is the Chair- Elect of Young Lawyers’ Division (NBA YLD). As Chair-Elect, Ms. Craine focuses on empowering young lawyers to be involved in voting rights and racial profiling issues in their local community. Recently, Ms. Craine published a law review article in the University of Baltimore Law Form on the changes in Maryland Law regarding collateral consequences within the criminal justice system. The Freedom Fund Committee shall plan and conduct fund-raising activities, entertainment and other projects, for local and national purposes within the scope of the Association’s program. It shall work closely with the Finance Committee.